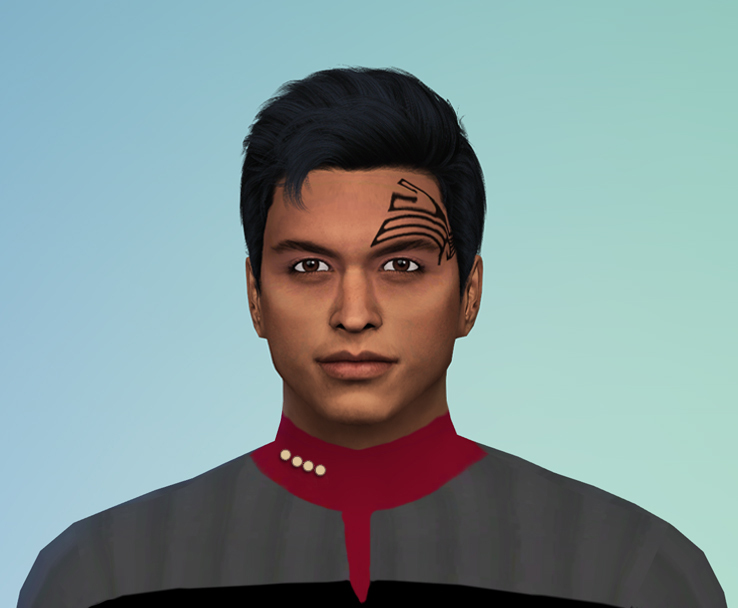 I had a go at making a Chakotay tattoo face-paint package for Sims 4. Meh! It did not go well. 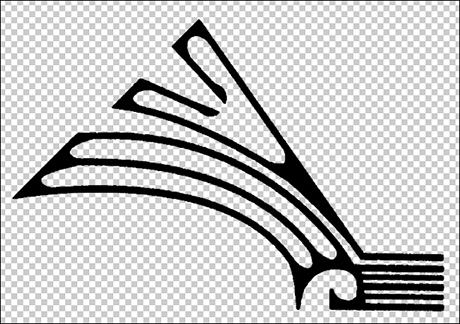 I made this copy of the tattoo on a transparent background and it looks pretty good. 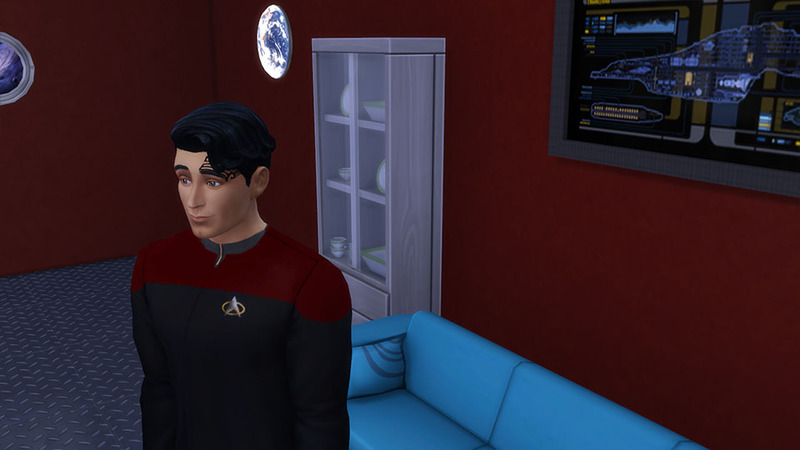 As you can see in the first two screenshots below, the way Sims 4 distorts it all when it renders in-game is awful, but I will persevere with it as I get time. In order to help it along, as you can see in the next three screenshots I chose a hairstyle which covers most of the distortion. 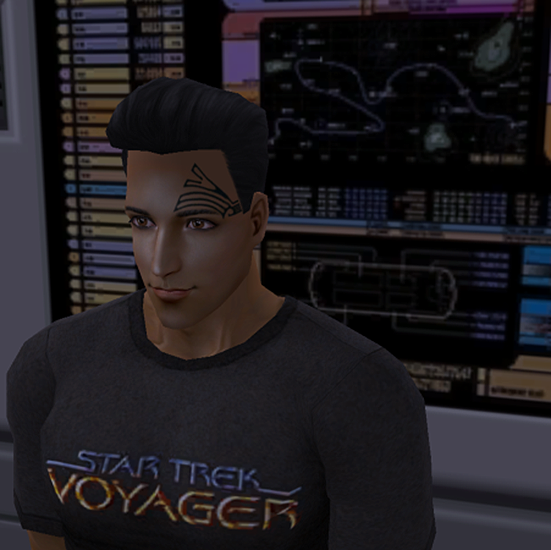 I tell myself that since Chakotay and Janeway got it on, Chakotay is going for a more relaxed look *grin*. 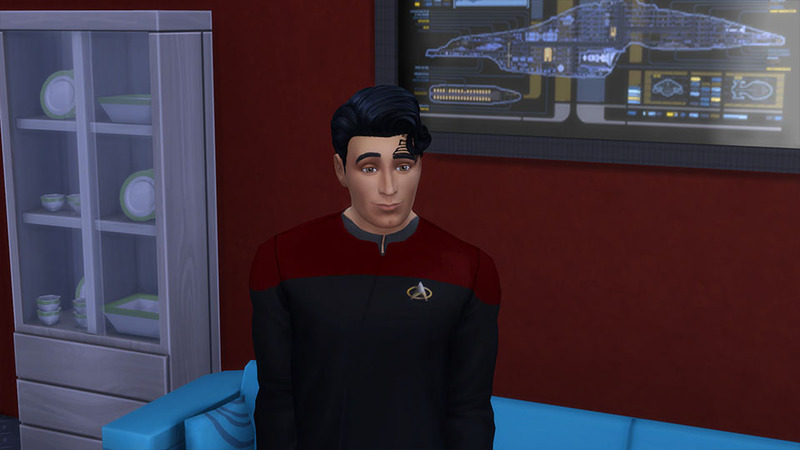 I have Base game, Get Together, Get To Work, and Holiday installed. 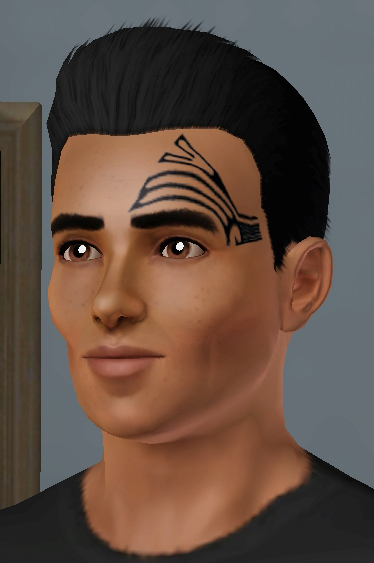 In order to simplify the tattoo downloads on this page I've zipped the Sims 2, Sims 3, and Sims 4 tattoo files into one file for download. Just make sure you add the right files to your Mods folder for your game. Please click HERE to download all of the tattoo files. 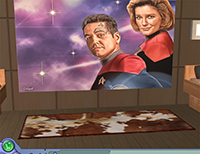 A way to make a floor-to-ceiling Voyager Ready-Room window with space scene included. This is a recolour of a base-game Build-mode wallpaper, made in 4 parts which go together 'in order' to make a 'wallpaper mural' window. You need to use the wallpapers in order, Voy 1 to Voy 4 and repeat as necessary. I've used them here on an outside wall so they don't disappear when you lower the inner-room walls. 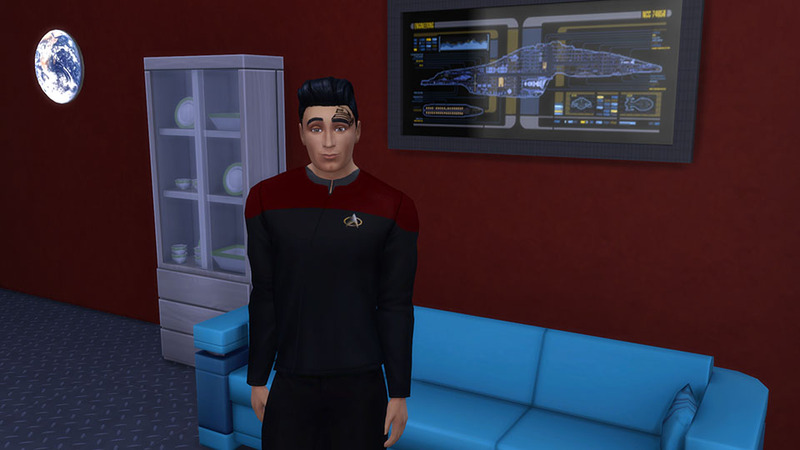 Download the file and extract to your Sims2 'downloads' folder. 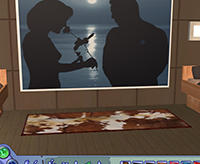 Each wallpaper section costs 9 simoleons. Click the picture to download the *.zip file, click the words 'Larger Picture' to see bigger preview. 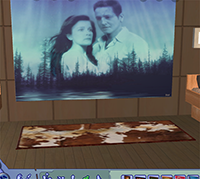 These are large, 4-tile recolours of Maxis' own "Two Dogs And An Olive" painting, so they require that you have Sims 2: Nightlife expansion pack installed. 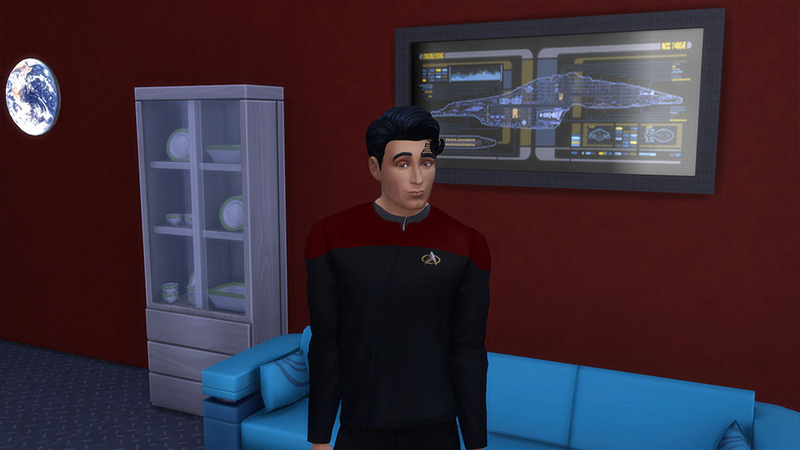 Just download your chosen file by clicking on the relative pic below, unzip, and copy the .package file to your My Documents|EA Games|The Sims2|Downloads folder. 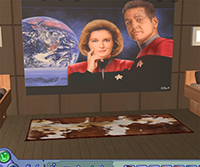 The Maxis "Two Dogs...." painting looks like this, and will appear in Buy Mode|Decorative|Wall Hangings, with my pics listed behind it.